1. Prepare Apple-Pecan Topping: In large skillet, melt butter over medium heat. Increase heat to medium-high. Add apples and cook 8 minutes or until lightly browned, stirring occasionally. Stir in water, brown sugar and salt. Reduce heat to medium and cook 20 minutes or until liquid is syrupy, stirring occasionally. Remove from heat and stir in pecans; cover to keep warm. 2. Meanwhile, prepare Cinnamon Waffles: Preheat waffle iron as manufacturer directs. In small microwave-safe bowl, heat butter in microwave oven on high 1 minute or until melted; let cool. In large bowl, with mixer at medium speed, beat eggs 3 minutes or until very pale and foamy. Into medium bowl, sift together flour, granulated sugar, baking powder, cinnamon and salt. Whisk milk and butter into flour mixture, whisking just until combined; do not overmix (batter will be lumpy). With wooden spoon, fold in eggs. 3. For each 5-inch waffle, with ladle, pour about 1/2 cup batter into waffle iron (enough to just cover surface of waffle iron). Cook waffles as manufacturer directs or until waffles are golden brown and steam is no longer escaping from iron. 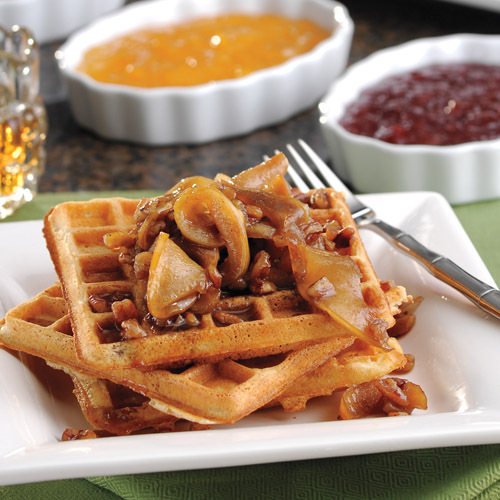 Serve waffles with Apple-Pecan Topping. To keep waffles warm, place them in a single layer on a baking sheet in a 200° oven.